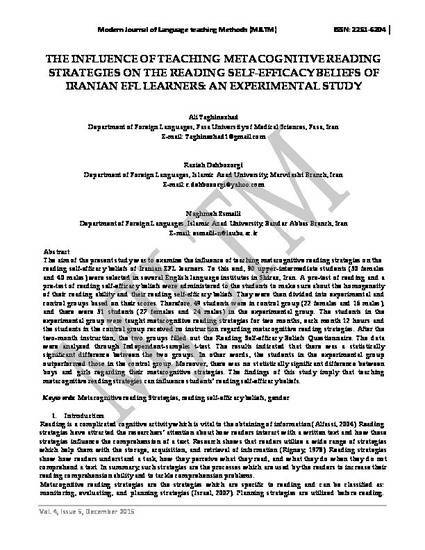 The aim of the present study was to examine the influence of teaching metacognitive reading strategies on the reading self-efficacy beliefs of Iranian EFL learners. To this end, 90 upper-intermediate students (50 females and 40 males) were selected in several English language institutes in Shiraz, Iran. A pre-test of reading and a pre-test of reading self-efficacy beliefs were administered to the students to make sure about the homogeneity of their reading ability and their reading self-efficacy beliefs. They were then divided into experimental and control groups based on their scores. Therefore, 49 students were in control group (22 females and 16 males), and there were 51 students (27 females and 24 males) in the experimental group. The students in the experimental group were taught metacognitive reading strategies for two months, each month 12 hours and the students in the control group received no instruction regarding metacognitive reading strategies. After the two-month instruction, the two groups filled out the Reading Self-efficacy Beliefs Questionnaire. The data were analyzed through Independent-samples t-test. The results indicated that there was a statistically significant difference between the two groups. In other words, the students in the experimental group outperformed those in the control group. Moreover, there was no statistically significant difference between boys and girls regarding their metacognitive strategies. The findings of this study imply that teaching metacognitive reading strategies can influence students’ reading self-efficacy beliefs.